Imagine what it would be like to endure an external numbness with such an internal burning sensation with pressure so incredibly intense that the most potent pain relievers are completely ineffective, leaving you with the feeling that your body is actually on fire, ready to implode any moment. You lose the ability to tell the difference between a sheet and a metal rod while, at the same time, the feeling of either causes the pain to become extraordinarily worse, something you didn’t think was even possible. Reflex Sympathetic Dystrophy (RSD) is a painful, disabling chronic neurological disorder that occurs when the nervous system malfunctions in response to a injury or illness — in my case who knows! RSD is characterized by: continuous sharp, stabbing, burning pain and pressure, numbness, extreme sensitivity to touch (including clothing, sheets, water, etc. ), severe headaches, painful skin discoloration and ulcers, intense and uncontrollable muscle spams, softening of bones (osteoporosis), dystonia, skin temperature & color changes, hair/nail growth changes, muscle atrophy, vascular & autonomic dysfunction, sensitivity to lights & sounds, depression, loss of vision and, even paralysis. This rare condition is a mystery to scientists & often is misdiagnosed. Much more research is needed to find the cause of RSD and ways to treat and prevent it. This is not a disease for which there is not a solid treatment in sight, let alone a cure. I have been signed up for, and committed to, a long term, never-ending battle with a pain scale. RSD is the most painful disease known to medicine. In every life, there are pivotal, ground-breaking moments. Moments that alter who we are, moments that change the very course of our existence. Our purpose on this earth shifts, and suddenly we find ourselves walking down a different path. Just like that. In the blink of an eye, everything we know is gone, and we are surrounded by unfamiliar territory. Because of my CRPS/RSD I am no longer able to do what I was born to be. That was to be a Gymnast. Ever since being diagnosed with CRPS/RSD I have missed doing so many thing like hanging out with my friends, knowing that I could defend myself if needed, or the simple things like running and jumping. but, the biggest thing and the most hardest part of all this has to be is being considered an athlete and having that competitive drive and I miss having something to work forwards to every day. For 17 years I’ve been apart of the Gymnastics World ever since the age of 3 and now knowing that I will no longer be able to do what I love and have a deep and lifelong passion for is something that will take a very long time for me to get past and accept. I’ve loved Gymnastics from the very beginning with so much passion, and drive, and fire that will never go away. Gymnastics to me is like falling in love, it’s like falling head over heels in love with somebody or something that there is nothing like it. It’s that feeling you can’t get anywhere else in the world, you can only find it in one place, and for me that one place in the whole world is and always will be The Marsha Zimmerman Gymnastics Gym. That’s where I found my peace and security to focus on what laid ahead for me. I retired from the world of Gymnastics due to years of injuries it broke my heart but it was also time to find a new challenge to climb. I’ve been involved in modeling in recent years and photography. But my heart will forever and always belong in sport of Gymnastics. Now that I was no longer in Gymnastics, I had to find something that could take the place of my first true love and that’s when my therapist suggested that I take a look at this Horse Ranch called Horses Healing Humans and I was like of course I’ll take a look I’ve always loved Horses. The first day I started volunteering at the horse ranch is when my Right Foot was stepped on by a 9 hundred pound Horse. I waited a few weeks to see my doctor to get a X-Ray the reason it took me so long to see my doctor was because the owner of the Ranch kept on telling me that all I was feeling was just bruised bone and that it would go away. But after 3 weeks of still being having constant pain in my right foot and was beginning to swell at the end of the day and that never happened before that’s when I finally went to the doctor and had a X-Ray done. There the X-Rays showed that there was no broken bones or fractures but when you are dealing with CRPS/RSD there doesn’t have to be any broken bones or fractures my foot was going through a traumatic injury. On top of that I had to get a bunion removed and a joint fussed where the Horse stepped on me about roughly 4 months later. My Surgery was January 6th, 2015. The Symptoms for CRPS began around January 9th. I was diagnosed on February 17th, 2015. My podiatrist referred me to my neurologist that I normally see due to having a seizure disorder since I was 9 years old. Fortunately, he was very familiar with CRPS and treats a number of patients with CRPS. So, I really only had to see one physician in order to get diagnosed. 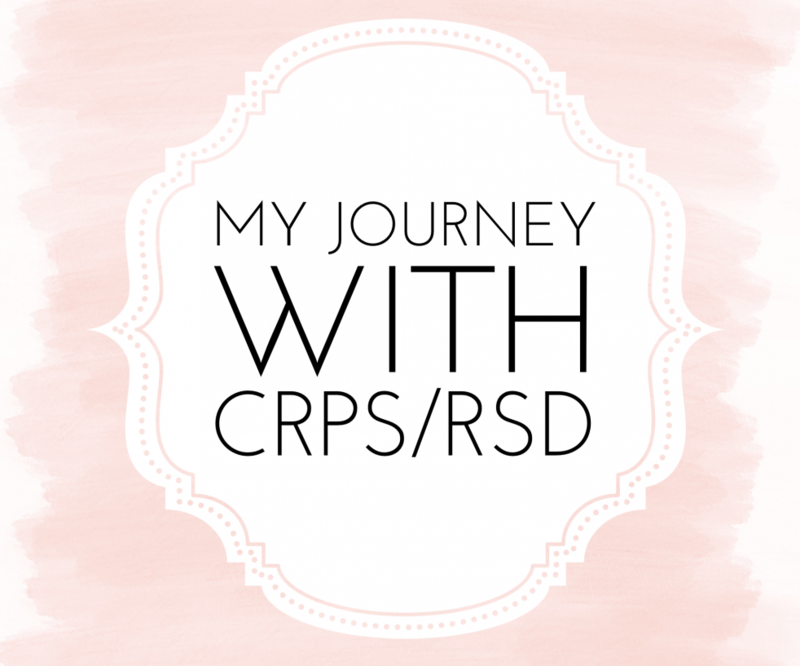 My symptoms were so classic and numerous, there was little doubt that I had CRPS. There are changes that have occurred since developing CRPS. I have pain associated with CRPS. Mental cognition changes with CRPS Chronic insomnia with CRPS. OCD issues that have developed with CRPS Inability to stand/walk/sit for long periods due to needing to elevate it often. Uncomfortable driving for more than 5 miles or so because of the vibrations of a car cause me pain and I’m afraid that if I need to stop suddenly, I may decide to favor my right foot rather than have the pain of slamming my foot down hard onto the brake pedal. Cannot push through additional pressures of work activities without having several bad days after that. Initially, my friends were always asking about me and contacted me a lot. But, over time, I slowly stopped hearing from them. I have read about this type of thing happening in blogs and Facebook pages that are about CRPS and chronic pain. My immediate family and extended family have really been great and continue to support me. If it wasn’t because of the support of my family and enduring the grueling physical therapy (as well as my mother having really good medical insurance to go to all the different practitioners I needed to see), I really don’t know where I would be today. I don’t know if I would be even walking yet. My faith in God has given me Hope and He has also given me that drive that I once had back when I was a Gymnast. He has driven me to show people that there is a reason why He chose me to be the that 1 in a Million to be diagnosed with this rare illness. I believe He chose me to be diagnosed with CRPS so that I take in what is around me and how I can help to make things a little bit better for someone. I believe He chose me to help raise awareness for those who can’t and to show people that there is someone in their corner fighting for them until the end. Previous Post Why Am I So Confused?